As we do each year, our school held Remembrance Day ceremonies just prior to the national holiday and the service had a profound influence on me. Observing the ceremony as a former social studies teacher and proud Canadian, I felt a deep attachment to our school, our community and to our country. Like many events and processes in contemporary schools, the ceremony was led by students. Students served as hosts and ushers for our guests, but also played a significant role in planning and organizing the entire ceremony. Students designed, decorated and set-up the stage. Two students served skillfully as ceremony emcees and our student council president delivered a poignant and intelligent speech on the importance of youth taking time to remember. The flag party was comprised of student cadets, the concert band performed brilliantly and art careers students contributed paintings and created an animation set to a song performed by the choir. Special guests included active personnel from the Royal Canadian Navy and a WWII veteran who was involved in patrolling the North Atlantic, a representative of the Board of Education, parents and many local seniors. The students and staff in the audience were quietly engaged and reflected with dignity and respect. 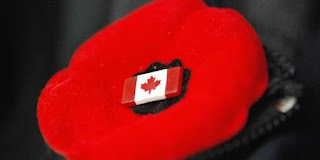 As it does every year, it made me feel very proud and fortunate – to be Canadian and to be connected to our school. Remembrance Day ceremonies are one of the many things that our public schools do very well and they serve a critical role in building community across the nation. Schools have a primary responsibility to nurture the cognitive abilities of young people to increase their life chances. However, our role in building a democratic nation of socially responsible and engaged citizens is equally important. Canadian public schools are a reflection of our society: vibrant, multicultural mosaics of people from many lands and socioeconomic backgrounds. Good schools spend years creating a sense of belonging and nurturing caring connections among students, staff, parents and their greater communities, including an understanding of the rights and responsibilities of living in Canada . Young, educated citizens from Canadian public schools will be advantaged in our increasingly diverse and interconnected world. As Bruce Beairsto wrote for the Canadian Education Association, “it is equally important that schools foster the sort of civil society in which students experience the “peace, order and good government” that our constitution envisages. Schools provide not only private good for individuals but also public good for society as a whole.” Like the tremendous sacrifices made by millions of Canadians who have answered the call to defend the democratic freedom we enjoy in Canada and protect others around the world, it is important that we remember this. Lest we Forget. The animation below was created by our talented art club and senior Art Careers students for the assembly. The story is based on the sonnet "High Flight" written by John Gillespie Magee Jr. Magee was a Royal Canadian Air Force pilot who died in a mid-air collision testing a Spitfire VZ-H in 1941. He ejected from the plane, but was too close to the ground, his parachute failed to open and he died on impact. The music was written by our music teacher and performed by our choir.